When a Link Monster’s effect is activated that targets this face-up card on the field (Quick Effect): You can destroy this card, then destroy all your opponent’s cards in the column this card was in. During the End Phase, if this card is in the GY because it was destroyed on the field by battle or card effect and sent there this turn: You can Special Summon 1 “Rokket” monster from your Deck, except “Metalrokket Dragon”. You can only use each effect of “Metalrokket Dragon” once per turn. Metalrokket Dragon may be the best of the Rokket monsters we’ve reviewed so far. This does potentially more than what Magnarokket does, as you take out everything in the column Metalrokket is in, not just a monster. While this does activate any destruction-triggered effects, and forces you to play into columns to maximize your damage, this could be a great first turn card if your opponent decides to go “T” formation, or “I” formation (baring you can activate this card’s effect via a Link Monster that turn). This card also opens up putting in a few Mekk-Knight cards for good measure. At the very least you should get the standard 1-for-1 trade Rokkets get and then get another Rokket at the End Phase. Metalrokket has the most power to it as long as you find your target, at worst, it’s like you’re running a situational Rokket that can take the form of Magnarokket or Autorokket. If you could take out a Link Monster, a monster, and a spell/trap with this, the opponent will be reeling. Metalrokket Dragon is Throwing back to more rokkets. All week have been dark dragons with the same Link Monster targeting effect to trigger self destruction and something else. The something else for Metalrokket is this one has 1700 Atk and non-targeting destruction of opponent’s cards in the same column as Metalrokket. Then we go back to what they all do, being replacing itself with a different rokket upon destruction. Honestly this is better turn two because you know the columns you might want to destroy, but being better in later turns is not a bad thing. During turn one you can still put this in a column with a Link Zone to scare the opponent off. 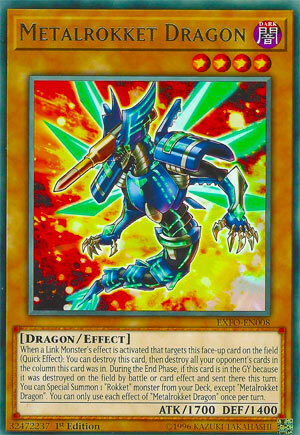 Metalrokket Dragon looks cool and is worth running because it can destroy different types of cards without targeting. We go from the Circuit Break Rokkets to the Extreme Force Rokkets with Metalrokket Dragon. Metalrokket Dragon is a Level 4 DARK Dragon with 1700 ATK and 1400 DEF, which are good stats on a Level 4 once again, though ATK is worse and DEF is better than yesterday. When a Link Monster targets this card (Quick Effect), you can destroy this card then destroy all your opponent’s card in the same column this was in. Nice way to remove multiple cards balanced by the fact that you have to put this in the right spot and your opponent can get around it by just putting their cards somewhere else. Put this in a column with your opponent’s Extra Monster Zone and they don’t have a choice unless they get rid of the monster in your Extra Monster Zone. You can also place this in a column your opponent has already placed multiple cards in just to target it with a Link Monster. Metalrokket might be the best form of removal with a fair balance to it via card placement. Metalrokket has the Rokket Effect we’ve seen all this week and will see tomorrow. Metalrokket is a must for Rokkets. Art: 3.5/5 I like the Circuit Break Rokkets a little better in terms of art. Metalrokket, and this is Dark, Level 4, Dragon (heard that a lot this week, didn’t we?) has 1700 attack, so stronger than one prior, but not as strong as the Rokket from yesterday, and 1400 defense. Metalrokket changes up the destruction we’ve seen from the past couple of cards and puts a new spin on it, in addition to being a solid attacker of his own. This time, the Link effect to target this card triggers Metalrokket to sacrifice itself and you get to destroy all cards your opponent controls in the same Column this card was in. This is a little more difficult to play, not to say this isn’t good (I do rather like this as it destroys even 1 card, you’re at a 1 for 1, but this could/should generate you a +x) if you’re playing Metalrokket smart. If you play this in any Column before your opponent has anything in it, they’re probably not as likely to use said Column to prevent you from destroying anything. But if you can spring it on them when it’s already full of cards, the advantage is yours and should grow in your favor quickly. Any card that requires a bit of thought to capitalize on is one I’m going to be a fan of. (And of course, there is the Special Summon a Rokket from the Deck ability, who isn’t this card, and each effect is once per turn. Don’t want to be any more repetitive than I need to). Art: 5/5 Great picture, similar to yesterday, with a beautiful color scheme, and I loev the green wings added to this picture.